Deacon John: Homily 19th Sunday Ordinary Time Year A - Courage! It is I! Homily 19th Sunday Ordinary Time Year A - Courage! It is I! It is not easy to respond to or even hear the call of God. The call can get lost in all the noise and activity of our daily lives. Then if we do hear His call, will we have the courage to respond, the courage as Peter did, to step out of the boat. As I said a few weeks ago I am proud of this community, I am proud of the changes I have seen over the last 3 years, I am proud of what you do and how you do it. I think you are an example in this diocese and in this country. You have embraced the challenges presented by parishes in communion and are thriving and growing. I love being here, I love serving here, I love being part of this parish. You should all be proud of what you have achieved these last few years. Now as I look out at the faces I know and love I am excited to see what you will be called to do, and what, with Christ’s help you will do next. I can think of a thousand challenges for you. You could read here at church, teach at our children’s liturgy, arrange flowers, clean, prepare for Mass, welcome, sing, lead bible study, join one of the committees and arrange social events or our liturgy, you could lobby parliament or large corporates for justice, you could invite your neighbours to church events, you could feed the homeless and support to poor, you could raise money and pay off the debts of this church, you could do so many things but what you should do first, is listen to God. He actually knows what he wants you to do, and I recommend you try and find out what that is and give it a go. Peter soon got scared by the winds and started to slip below the water, and I wouldn’t be at all surprised if that started to happen to you when you start to do something new for the Lord. Few if any of us have the faith to move mountains by asking them to move. Few if any of us would feel we had the faith to step out on a lake and walk across it. And none of us could achieve even the smallest thing for God, if God wasn’t involved. I want you to listen to God. Pray to Him and ask Him what He is asking you to do. Listen, listen and keep listening. He might not tell you immediately, you might not hear Him immediately. God shouted at me for 30 years before I heard the first whisper. Once you start to hear, don’t panic. Once you start to think I should be doing something about this or that, I should be helping here or there. That’s when you start to pray for the strength, for the faith, for the gifts to do what’s being asked. That’s when you start to talk to your friends, the people in the pews next to you, Fr Frank and Fr Jim, even me. God may be telling us the same thing or just to help you. 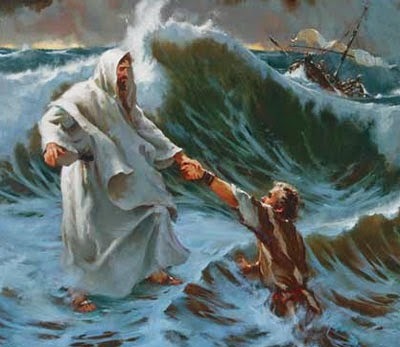 Once you start and things start going wrong cry out for help and I promise you, Jesus will reach down and pull you up, just as he puller Peter from the lake.